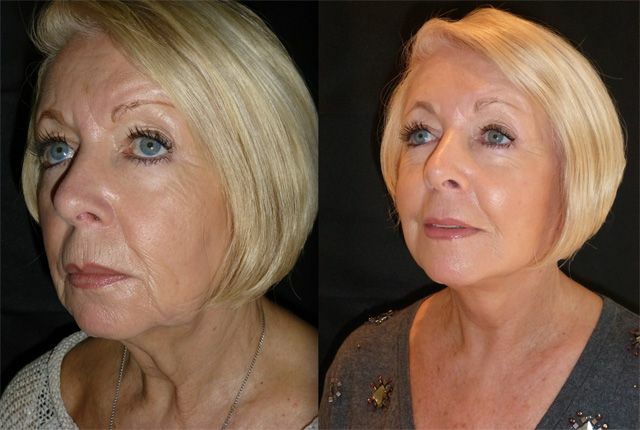 Pauline in her own words had been researching facelifts online ‘for years’. She was put off by the downtime and general anaesthetic that was required. On recommendation she came to see me. 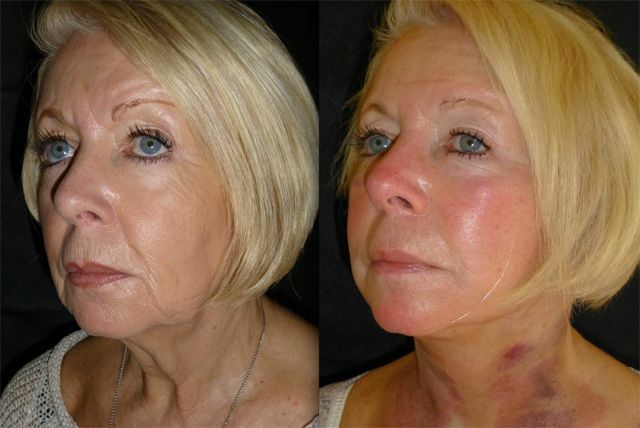 I explained that she would need a full facelift and neck lift and some jowl liposuction all of which could be performed under local anaesthetic. She decided to go for it! Here is her progress. 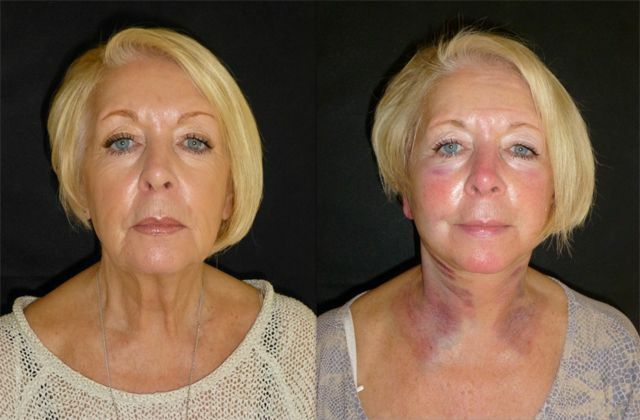 This is Pauline the morning after full facelift, neck lift and liposuction. 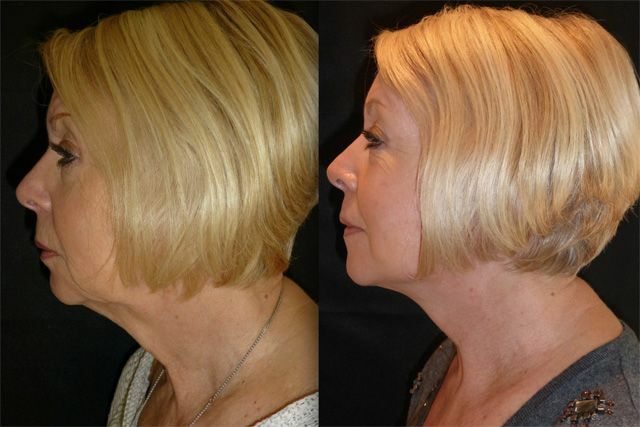 Infact her surgery was less than 15 hours before these photos were taken. Her hair has been washed and has undergone gentle manual lymphatic drainage. A stretchy removable face garment needs to be worn for a week when she will be reviewed again for removal of her fine stitches. Pauline is back for removal of her sutures and looks great. Fresh, rejuvenated and well. 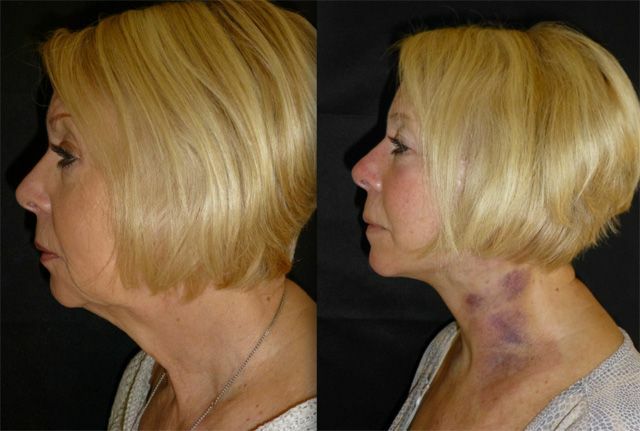 She has a little bruising in the neck which is to be expected after her jowl lipo but this will fade within days. 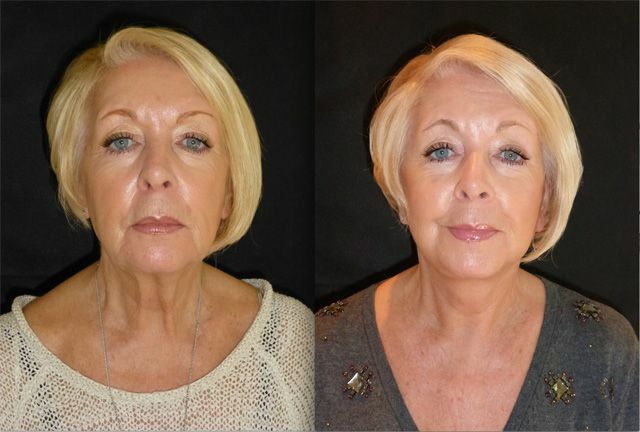 Pauline unexpectedly and very kindly reviewed her treatment the evening after these photos were taken. Here is what she said. 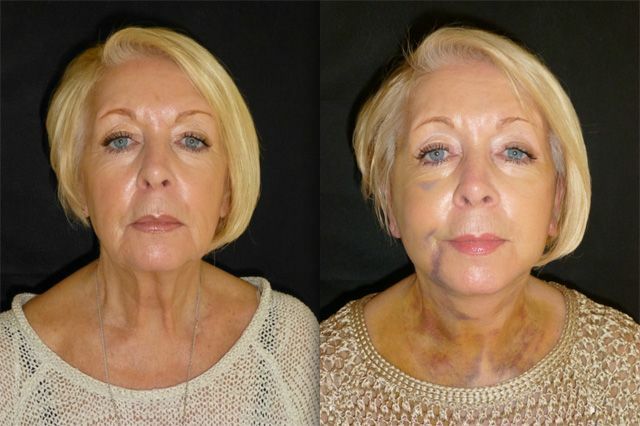 "I have looked on websites for years about facelifts but always felt scared about surgery. When I saw that you could have a local anaesthetic and no hospital stay I became really interested. 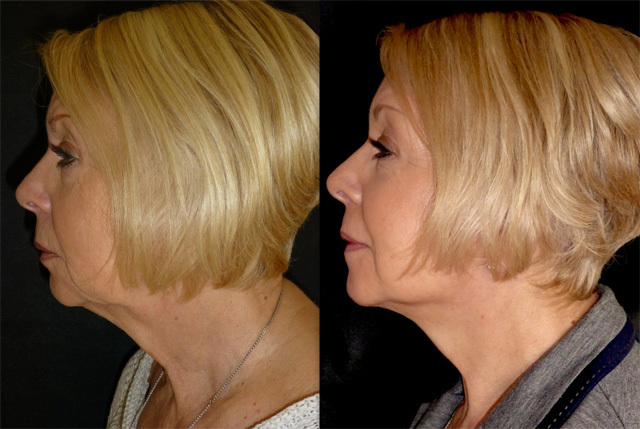 My consultation with Dominic was so informative and relaxed and he took away all my previous fears about having a facelift. I did not want to be put out completely so I was aware of what was going on all the time. I didn't feel any pain and was reassured all the way through the procedure. I had my stitches out yesterday and I am absolutely thrilled with the results. I honestly believe I could not have found a more caring surgeon than Dominic. So to all those ladies (and men) who are really scared about surgery, you will be amazed at the results." Pauline is now 4 weeks from Surgery and is looking fresh and healthy. Her skin is in great condition and her cheeks are voluminous. The lax skin on her neck has settled to leave a lovely neck line. 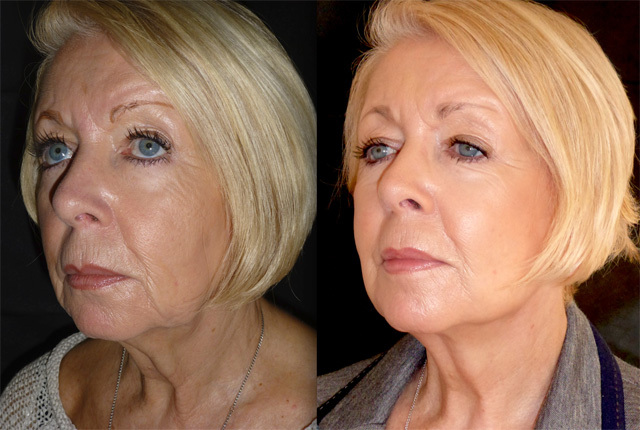 Even her under eye hollowing has improved despite no eyelid surgery. I saw Pauline today and she looks as good as ever. 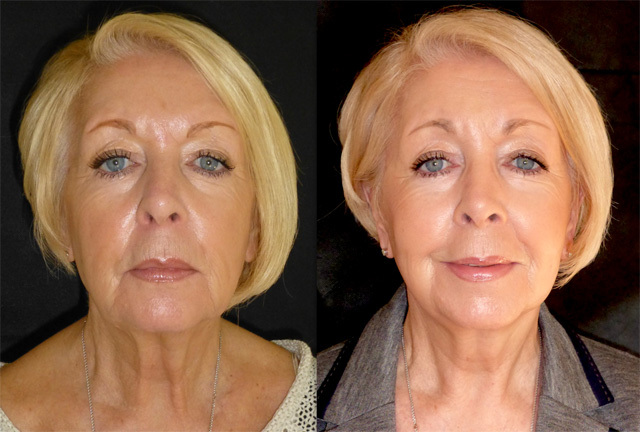 She has started a skin care programme to maximise the longevity of her natural result. It is working - her skin is looking fantastic. 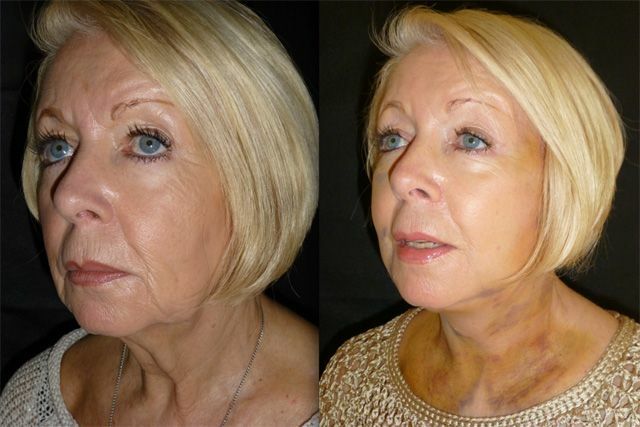 She has had some relaxation of her facial soft tissues which is expected as operative swelling subsides but she retains her defined features, voluminous mid face and neckline. 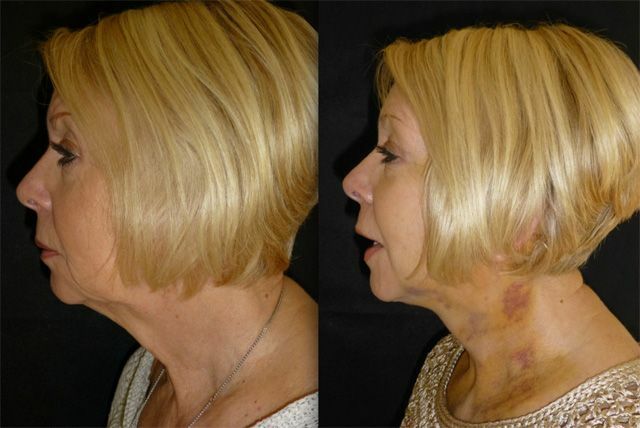 Her front neck bands are reappearing which is likely to be due to not performing a platysmaplasty at the same time as her facelift and neck lift. Should these become more prominent, I will fix these with a 30 minute platysmaplasty under local anaesthetic alone. At the moment however this isn’t needed.